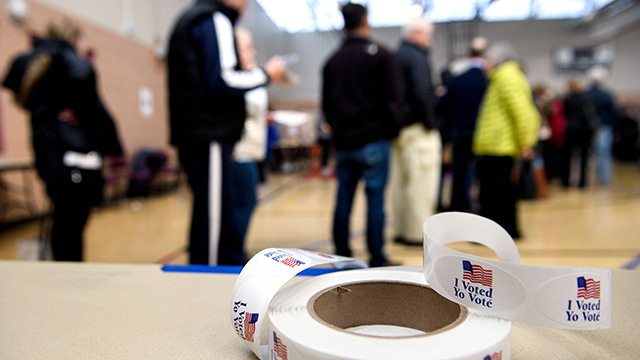 With this year’s midterm elections just a week away, here are some key findings from Pew Research Center surveys over the past several months about some of the dynamics and issues shaping the battle for Congress. Large shares of voters – in both parties – say which party controls Congress is a factor in their vote this year. 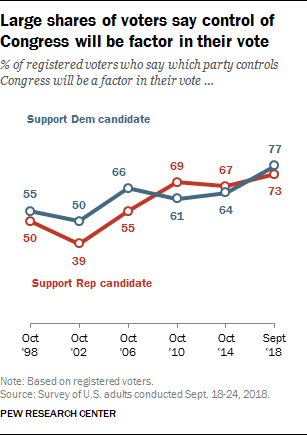 About three-quarters of registered voters who support Democratic candidates (77%) and those who support Republican candidates (73%) say which party controls Congress will factor into their vote. And large majorities of those backing Democrats (77%) and those supporting Republicans (82%) expect their party to hold a House majority after the elections. But Republicans are more bullish than Democrats about Senate control: 87% of Republican voters expect the GOP to hold a Senate majority; 62% of Democratic voters expect their party to have the majority. Health care and the economy are among the top voting issues. About three-quarters of registered voters cite health care (75%) and the economy (74%) as very important issues to their vote this year, but there are partisan divisions. Nearly nine-in-ten Democratic candidate supporters (88%) say health care is very important, compared with six-in-ten Republican supporters. On the economy, 85% of Republican voters cite this as a very important issue for their vote, compared with 66% of Democratic voters. In the survey, conducted amid the Senate’s confirmation proceedings for Associate Supreme Court Justice Brett Kavanaugh, large shares of Democratic (81%) and Republican voters (72%) also said Supreme Court appointments would be a very important voting issue. Partisans are also divided on other national issues. While 85% of Democratic voters say the treatment of racial and ethnic minorities will be very important in their vote, just 43% of Republicans say the same. Democrats also are much more likely than Republicans to cite the environment as a very important voting issue (by 82% to 38%). And the treatment of gay, lesbian and transgender people is cited as a very important issue by two-thirds of Democrats (66%) and just 24% of Republicans. 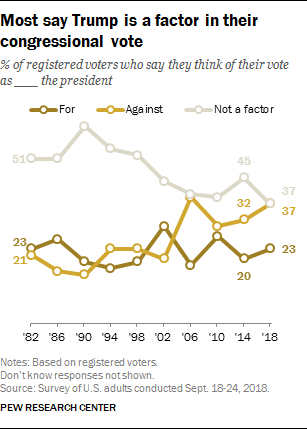 Voter enthusiasm is at its highest level during any midterm in more than 20 years. Two-thirds of Democratic voters (67%) and 59% of Republican voters say they are more enthusiastic than usual about voting than in past congressional elections. 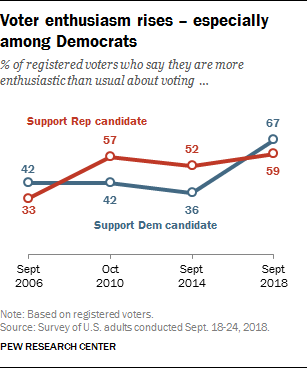 Democrats in particular are much more enthusiastic than at similar points in previous midterms. Four years ago, just 36% of Democratic voters said they were more enthusiastic about voting than usual. Among Republicans, there has been less change (52% then, 59% today). In a separate survey conducted this summer, registered voters supporting Democrats were more likely to say they had attended a political rally or event in the past year (22%, compared with just 8% of Republican voters). The gap was more modest in the shares of Democratic and Republican voters saying they had donated to a campaign during that time (23% and 18%, respectively). Turnout in this year’s U.S. House primaries rose sharply, especially on the Democratic side. Nearly a fifth (19.6%) of registered voters – about 37 million – cast ballots in House primary elections, a sizable increase from 13.7% (23.7 million) in 2014. While turnout rates rose this year in both Democratic and Republican House primaries, the increase was greater on the Democratic side – up 4.6 percentage points versus a 1.2-point increase on the Republican side. Turnout rates were also substantially higher in this year’s Senate and gubernatorial primaries than in 2014. President Trump looms large in many Americans’ congressional vote. Overall, six-in-ten registered voters say that Donald Trump will factor into their vote for Congress this fall. More than a third of voters (37%) say they consider their congressional ballot as a vote against Trump, while about a quarter (23%) say they consider it a vote for Trump – these views are, perhaps unsurprisingly, split by party: 66% of Democratic and Democratic-leaning voters view their vote as a vote against Trump, while 48% of GOP voters say their vote is a vote for the president. Voters are concerned that lawmakers will not strike the right balance in overseeing the Trump administration – no matter which party prevails. A majority of voters (64%) say if Republicans keep control of Congress, they are very or somewhat concerned that the GOP will not focus enough on oversight of the administration. 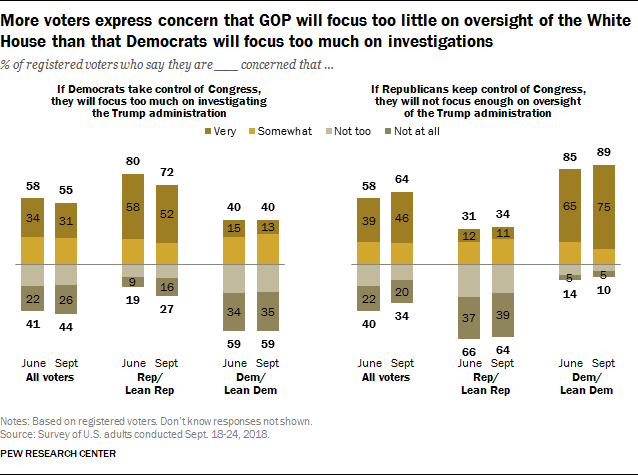 A smaller majority (55%) are concerned that if the Democrats take control of Congress, they will focus too much on investigating the Trump administration. These opinions remain deeply divided along partisan lines. Majorities in both parties say immigration is very important to their vote, but there are sharp partisan divides on key aspects of that issue. About seven-in-ten voters who back Republican candidates (71%) and 64% of voters who back Democratic candidates consider the immigration issue important to their vote. But the two groups have very different views about this issue. Asked about different problems facing the country, 75% of GOP voters say illegal immigration is a “very big” problem in the country today. Just 19% of Democratic voters say the same. And while nearly six-in-ten Democratic voters (57%) say the way immigrants who are in the country illegally are treated is a very big problem, just 15% of Republican voters say this. The number of Latino eligible voters and their share of the overall electorate have hit new highs. More than 29 million Latinos are eligible to vote nationwide in 2018, making up 12.8% of all eligible voters. Between 2014 and 2018, an additional 4 million Hispanics became eligible voters (U.S. citizens ages 18 and older). At the same time, the Latino voter turnout rate in midterm elections has declined since 2006. In 2018, Latino registered voters show signs of being more engaged in the midterm elections than in past midterm seasons. More Hispanic voters today say they have given “quite a lot” of thought to the coming election than said so in 2014 and 2010, and 55% of these voters say they are more enthusiastic about voting this year than in previous congressional elections.